Aside from cranking up the top instead of lifting by hand, very little has changed on the trailer compared to my Palomino Pony from 1988. 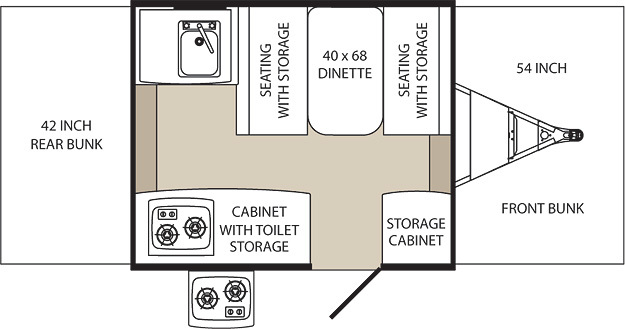 The floor plan has changed quite a bit, with a sink, stove and sideways dinette, which explains why the new version is TWICE the weight of my light little 1988 model. I’m surprised at how much is the SAME however. The beds pull out the same. The supports under the beds look EXACTLY like mine. 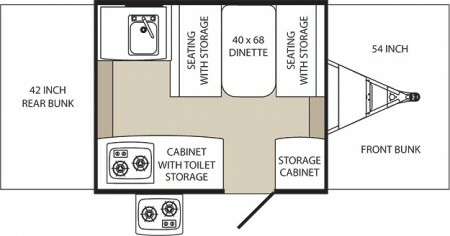 So little has changed that I feel a sort of comfort from Palomino RV. If I ever want to buy a brand new one, I might be tempted to buy this exact one, even though it’s so much like my current tent trailer. There is something to be said for consistency. Automobile manufacturers change so many things from one year to the next that you can never buy the same car twice. If you really love your current car, except for the fact that it’s ten years old, you’re out of luck. They don’t make that car anymore. With a Palomino tent trailer, however, even if your beloved trailer is almost THIRTY years old, you’ll be able to replace it with one that works and looks almost exactly the same. I find that incredibly comforting!